Margarita Escarpa trained at the “Real Conservatorio Superior de Madrid”. She studied with Valentín Bielsa, Demetrio Ballesteros, Gerardo Arriaga, Miguel Ángel Girollet and David Russell, and was subjected to the influence of some of the best modern performers. She completed her academic education graduating with the Extraordinary Prize, and a short time later received her Bachelor degree in Mathematics from the “Universidad Autónoma de Madrid”. She has been awarded two national and eight international prizes including first prize at the 20th Solo Guitar Competition organized by the Guitar Foundation of America. The combination of these prizes and her talent has provided her with the opportunity to regularly participate in some of the most important music festivals in Europe, Asia and America. Specialist critics and audiences enthusiastically acclaim her artistic sensitivity and her technical competence, both guided by her extensive musical training. As a soloist, Margarita has recorded compact discs for RTVE, Ópera Tres, Naxos, GHA Records and Maricam Studio. She presently teaches at the Vigo Conservatory in Spain, where she continues perfecting her technique with her pupils. 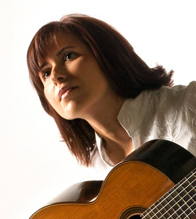 Margarita plays with a George Lowden 's guitar (North Ireland) and with a Matthias Dammann's guitar (Germany), and uses D'Addario strings. the Volterra Project, Summer Guitar Institute is a nonprofit association. We need all your support!! !